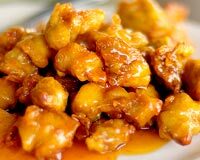 Orange chicken with marinade and seasoning sauce. In a large skillet, heat oil over medium heat. Add chicken, cook and stir about 5 to 7 minutes. Sprinkle with lemon pepper while cooking. In a medium bowl, combine mayonnaise, ranch dressing, orange juice, and brown sugar. Stir mixture into chicken, mix well. Add rice and green pepper, bring to a boil. Cook 5 minutes. Remove from heat and add mandarin oranges. Cover and let stand 5 minutes.